Since his DLive account was announced yesterday morning, he’s amassed 406,000 followers on the platform, and has received roughly $26,000 in Lino Point donations. Call me cynical, but this is just about the money. Aside from the money pewdiepie will get from the platform from streaming, I'm guessing they've paid him a lot of money to promote their platform with that video. - I did notice it was labelled as "paid promotion" - Nothing wrong with that but I'm not sure all his bro army minions quite understand the money changing hands behind the scenes. Thoughts? Are they backed by a major competitor like Amazon is to Google? Doubt it. Even Facebook is on the streaming push. So no. I don't think there's anything of substance here. Just marketing stunt. They need way more than mr P to get anywhere. Agreed. It's crazy how quickly it works but it's not surprising. I remember I used to read a lot of Archie comics. I'm not American and they did influence me when I was young. So much so, that when my family and I moved countries and found the Capri Sun juice that was hammered into the Archie comics, I was an instant customer. Imagine, the advertizing was so effective then, Pewds is todays live version of that effect. I personally rather stay on youtube since my growth was there since day one. Sure the 30% cut on the donations & memberships are a bit greedy. But there are still ways to earn $$$ on any platform if you have a large following. Just like Crown said, his "bros" will do anything. People would do the same for you if they are a big fan of you. The platform is just a stepping stone, expanding your own brand is the next level. 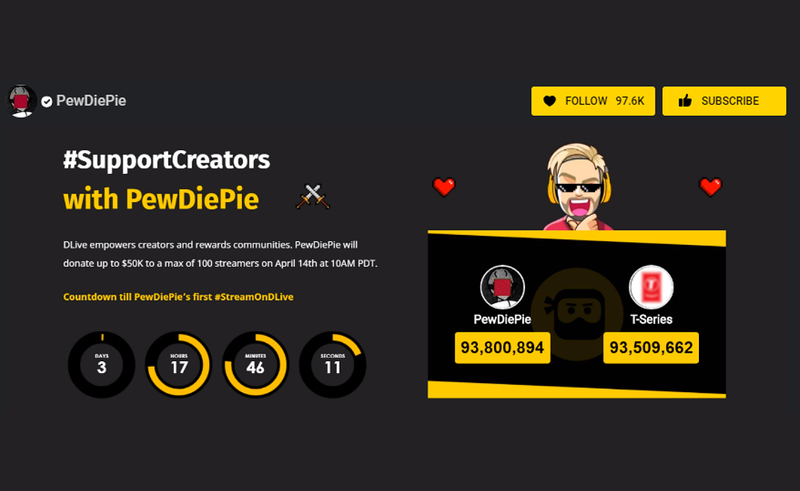 Well, in respect of DLive this is a really smart move. Twitch has established itself as THE streaming platform, so it's really hard to get into that market. Getting the biggest guy on Youtube on their side (no matter how much money is involved) is a huge and smart step. Because don't forget that Pewds isn't only an influence on his audience, he is an influence on Creators as well. Plus, a new platform means new opportunities to be in the front guard of their growth. Youtube and Twitch are so saturated that I don't blame people for trying out new platforms. This won't work, remamber gamejolt that pew helped and now that site is filled with fan-made games with pew no longer supporting it. That is the same fate i see in this platfourm as many other ones.